A requirement to take good care of a small baby is not like us, adult, especially when it comes to sleep time. Did you know that the bigger the space that they sleep in can lead them to a symptom called Sudden Infant Death Syndrome (SIDS)? It happens during their rest and they feel nothing holding them, with no grip and no fit surrounding. For some reasons, it is worth knowing that the baby’s tiny body seems comfortable and cozy in a small cradle or bassinet that would actually fit their size. Also, why would you want a big bed when they are still very small? Not just that, you wouldn’t want your child to accidentally fall off from your enormous bed when you have fallen asleep, would you? With the introduction to this 5 best bassinets below, you will get to bring new good experience for your precious little one! If your baby weight is somewhere between 16 pounds, this infant bed from Delta Children would be one best recommendation for you. The design of this product is quite simple for that it is white but it is a color to soothe the baby into a good sleep. 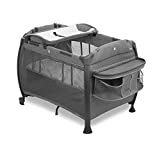 It has a canopy that covers almost half the size of the small crib but you can either take it out or just flip it back if it gets in the way. For the materials under the soft polyester fiber pad, there is a steel frame that is strong enough to keep the baby safe inside. Not to also forget, it even has a small device that plays soft music and creates a calming night light. Underneath, there two large baskets which you can store the baby essentials like a diaper, milk powder, or clothes, etc. This bassinet cares for both the small one and the parents indeed! This second baby bed over here will definitely fit for all newborns as it has a wider space comparing to the previous product. Joovy cradle’s dimension is 39.5 x 28.5 x 32.5 inches and 31.5 pounds. It can hold a baby of 25 pounds and have no problem at all. Attached on the top frame, there is a baby size table which you can get them ready for a bed such as putting on their clothes and diapers. To make it more convenient and organized, it also comes with a huge side pocket that gives you plenty of storage place. Not to also mention the waterproof cotton sheet that covers the whole bassinet in order to keep it dry no matter in what situation. Moreover, this is a two wheel bed which allows you to move as much as you want. Now you can bring your baby with you to everywhere inside the house! Coming with 4 choices of beautiful colors and patterns, this cradle from Halo is an ideal one for babies up to five-month-old. It can be tuck at under all kind of beds because you can adjust the level of its side wall. The best part about it is, it can rotate 360 degrees which you can get your baby close to you as desire. Most importantly, it has an electronic gadget that helps both you as mother and the baby. The tool can make various functions including 3 soothing music, dim night light, 3 lullabies, and auto shutdown after 30 minutes. Isn’t this amazing? Talking about comfy, the sheet that the baby will be sleeping on is 100% polyester that gives all the cozy feeling they need. For mothers who are recovering from C-Section, get this product now and it will do all the chores for you. As you can notice, cradle or crip are somehow like a carriage. The main purpose of using it is to keep your baby protected in one place while they are sleeping. So far, this fourth product from Dream on Me has been putting most couples at ease. It is a spacious bassinet that comes in 8 lovely colors to fit your beloved one. On the bottom of the two stand bar, there are two pairs of hooded wheels which can play two main functions. Either you want the mini bed to stay still by locking the wheels or turn into a rocking cradle by rotating them in upside position. 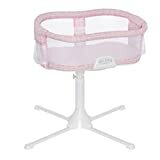 Plus, with the canopy that can cover the entire bassinet, it is quite beneficial for protecting the baby from insects and mosquitoes. As for the mattress sheet, it is so soft that will put he/she into sleep in no time. Coming to this final product which is looking quite unique and stands out the most compared to others above. This cradle from Monte has a design that is very simple yet attractive in a way. It is available in 3 colors choices; white, grey, and white/grey. Speaking about its function, it is built with a special waterproof mattress that is to keep the baby away from any wet occasion. Moreover, the fabric that is on the basket is washable. Therefore, your little one’s hygiene and cleanliness are definitely under safe control. On the inside, you will see a white fitted sheet that is 100% cotton. Not to mention, the sheets come in 2 pieces in the package for you to take turn using. It is also worth knowing that the frame for this is handcrafted and carefully made. That is to ensure the baby’s safeness while they enjoy sleeping!